Growing up in tropical country, my husband and I got the privilege to enjoy different kind of mangoes: the sweet kind, the semi sweet kind: 'Manalagi' (my favorite), the sour one, and so on. I was very surprised when I moved to the U.S. and met a friend in college who never try mango. If you like my friend, please go ahead and buy one when you find it at supermarket. I promise it doesn't taste or smell strange like 'durian'. Who knows you might even like it. Anyway, we found very sweet mangoes at Costco lately and our boys love it so much. Max asked if I can make mango ice cream so they got the enjoy the mango longer. Great idea I thought so off I went to the kitchen. A day later it's done. My boys couldn't wait devour the fresh mango ice cream straight from the ice cream machine. 1. Heat the milk, salt, cream and sugar in a medium saucepan until the sugar is completely dissolved then turn off the heat. 2. In a separate bowl, stir together the egg yolks. Rewarm the milk mixture then gradually pour some of it into the yolks, whisking constantly as you pour. Scrape the warmed yolks and milk back into the saucepan. 3. Cook over low heat, stirring constantly and scraping the bottom with a wooden spatula, until it reach 80 degree Celsius. 4. Set a strainer on the top of a container. Strain the custard into the container. Stir in the vanilla extract then let it cool until it reaches room temperature. 5. 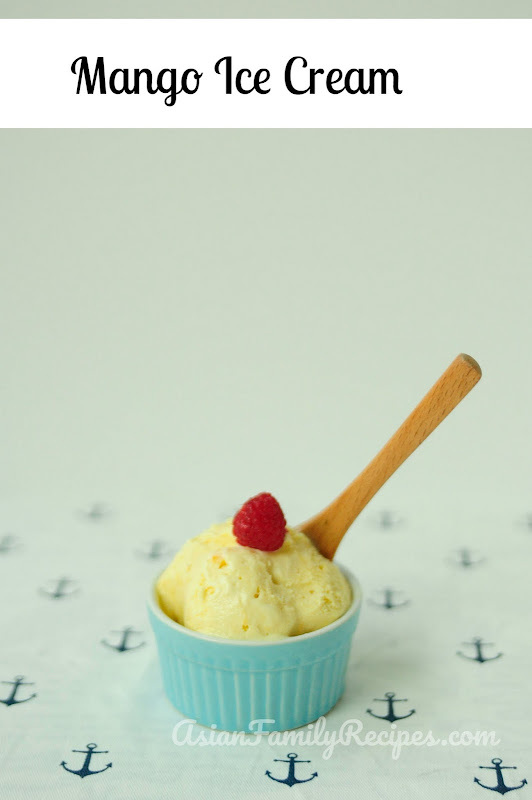 Refrigerate overnight, pour the custard and the mango cubes inside your ice cream maker and churn for 25 minutes.